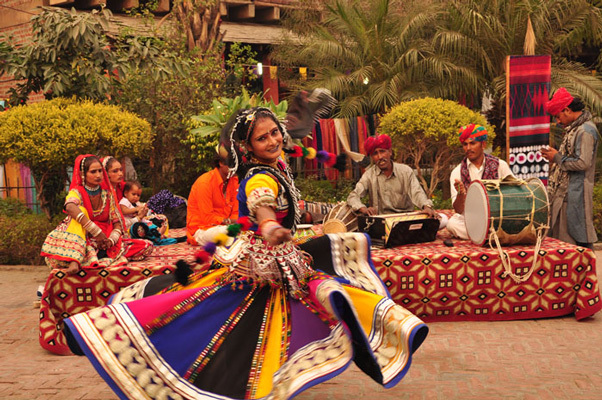 The ongoing 30th annual Dastkari mela is here and up at Dilli Haat, INA! 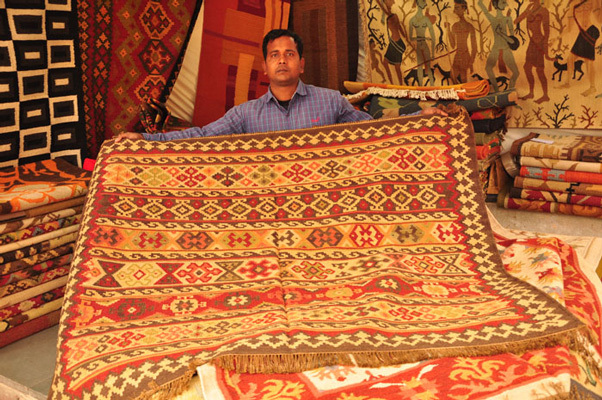 For the uninitiated, Dastkari Haat Samiti is a national association of Indian craftspeople established in 1986 to bring to fore the majesty of handicraft workers - visit Dilli Haat before 15th January 2016 for beautiful and one-of-a-kind workmanship on a gigantic variety of things. Since there are about 200 stalls presenting their ethnic specialities, we have shortlisted 10 stalls that you absolutely should not miss! 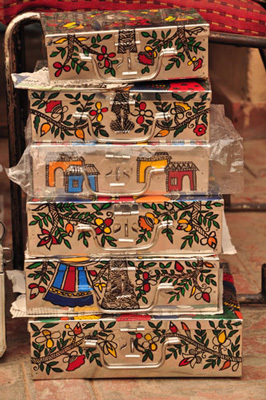 Visit this stall for terracotta and bamboo-based hand painted earrings, beautiful carved lampshades and serving trays. 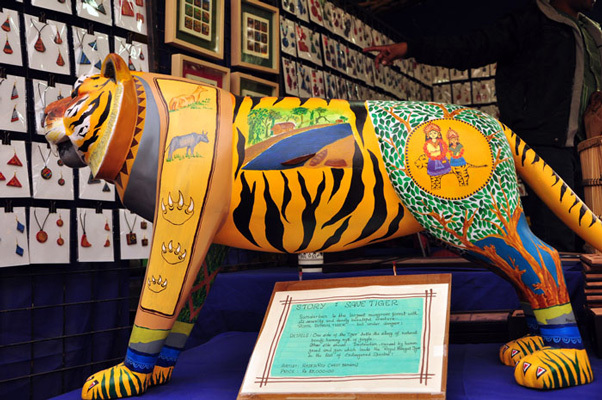 But the most captivating of all is the life size fiberglass-based royal bengal tiger’s sculpture, a part of Save the Tiger project, which captures the duality of life and destruction. 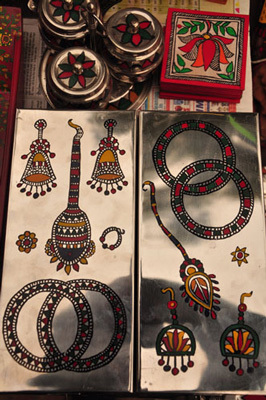 Originally called Mithila, and now famous as Madhubani carvings which originated in Bihar and draw mythical linkages to epics like Ramayana are to be found on paintings (framed and unframed), jewellery boxes, trunks, kitchenware, letterbox, serving trays, coasters to add the ethnic zing to your home furnishings. Pretty as a button, these! 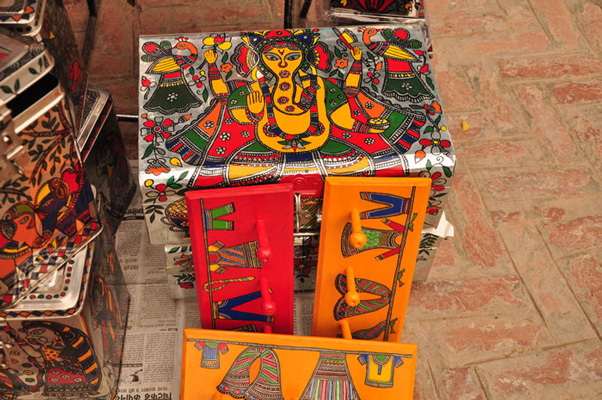 Here, you&apos;ll marvel at Patachitra, hailing from West Bengal, the creative art of detailed storytelling through paintings made out of nothing other than vegetable colours and available in a variety of sizes ranging from size A-3 to long foldable rolls. Stories vary from mythological ones to concerning contemporary issues such as tsunami, 9/11 attacks and similar philosophical themes. What you find in this stall, we bet you won’t find anyplace else! 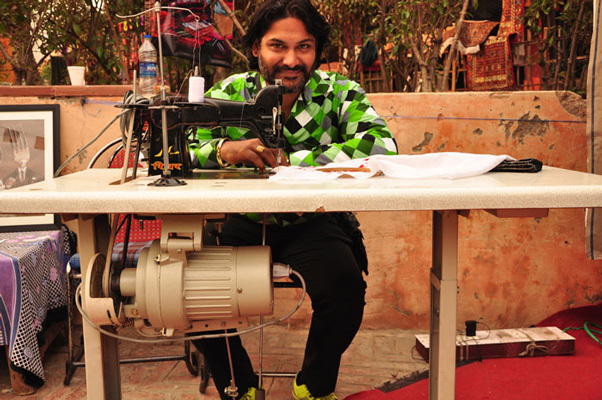 The work of Arun Bajaj in sewing art on cloth is patented, and he’s literally a world record holder. 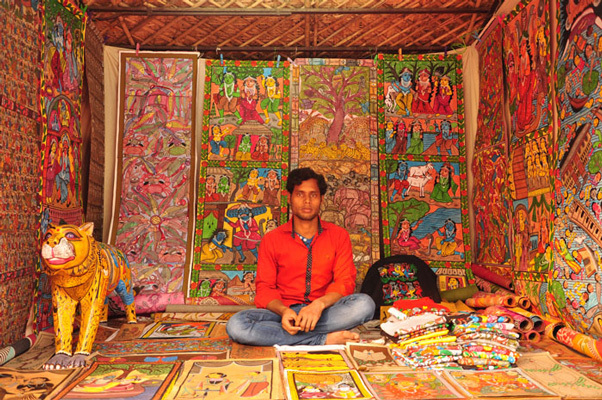 Visit this corner to see thread-based art visualising famous people, social evils, Hindu gods among other things and you may think him giving a live demo too! This stall is laden with jewellery by Gehna Handicrafts, who make meenakari and other kinds of work using silver, lac and semi-precious stones. Visit this Jaipur-based stall for beautiful earrings, tops, bracelets and elaborate necklaces that you’ll love flaunting! 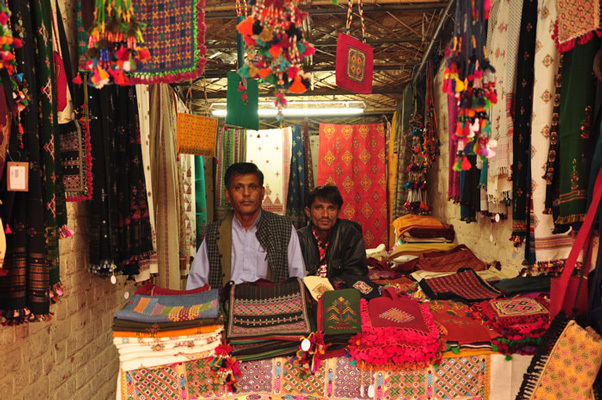 Stroll up here, and you&apos;ll find amazing vibrant dupattas, scarves and cloth pieces to brighten up any occasion. Brocade embroidery on cotton silk, pure silk, satin will definitely add some royal glamour to your wardrobe. This stall will aesthetically please your eyes and soul. 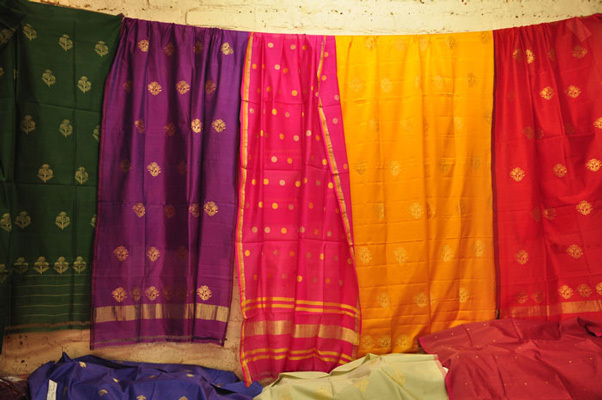 They offer home furnishings like cushions covers, pillows, bedsheets in applique work especially found in Ahmedabad. 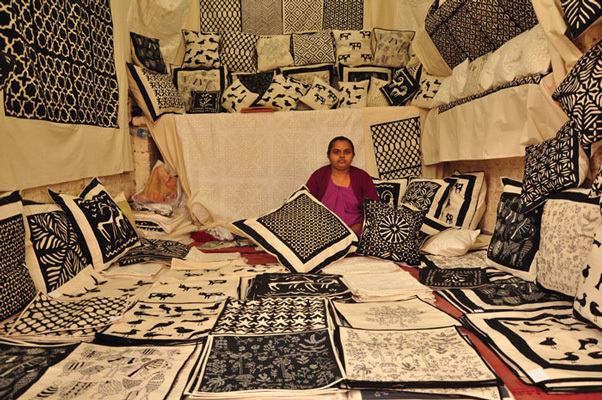 The work is simple yet elegant with copious use of minimal colours - just black and white with intrinsic designs made solely by skillful cutting of the cloth. 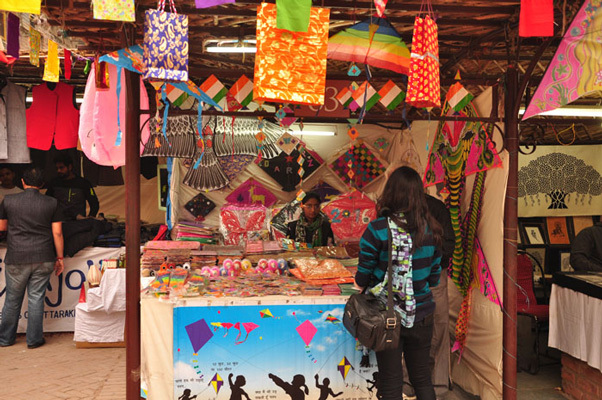 This vibrant stall will totally bring out the child in you - its walls are adorned by kites of all shapes, images, sizes and colors! They also have beautiful handmade envelopes and bags made entirely of paper, bamboo stick and fabric with all little details hand-painted. Visit this stall if you&apos;ve a special corner in your heart for biodegradable, pretty things. 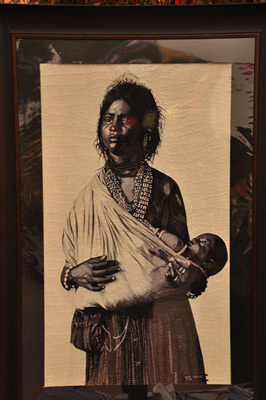 Daibiru Hut brings it&apos;s beautiful and detailed embroidery on cloth from Bhuj, Cutch. 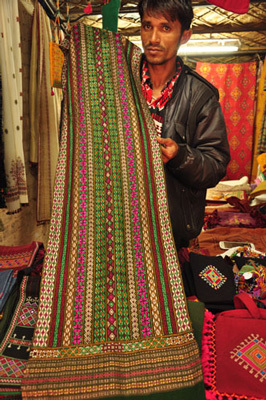 Their traditional thread work can be found on Sarees, bags, dupattas, scarves, wall hangings and mobile covers. 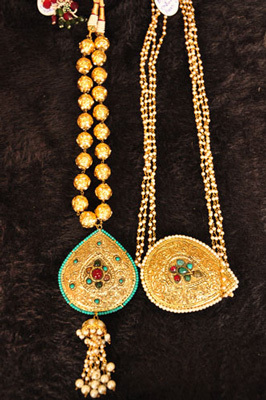 Little pouches and bags are decorated with beads along with intricate thread work to give them a pop of color and bling. Come, be dazzled! 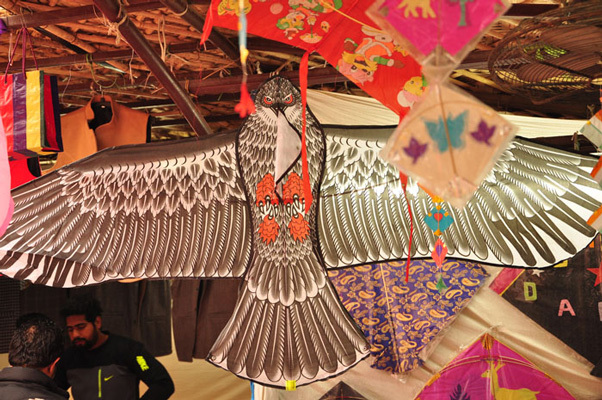 This stall proudly displays a handicraft tradition as old as Colonial India. 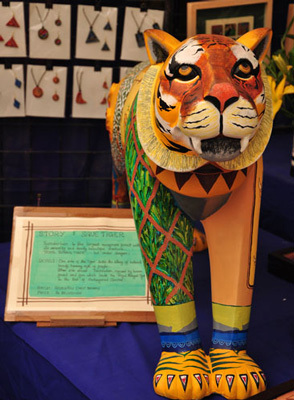 Workmanship is displayed on silk, cotton wool and pure wool with designs offering a wide variety to shop from. Sizes too are available aplenty, making customers spoilt for choice. Happy Shopping people! This one cannot, we repeat, cannot be missed!